This is for all my smokers and you non-smokers can get in on this too. 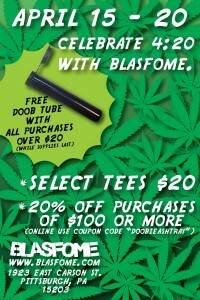 This week April 15 – 20th we will be hosting the Blasfome Annual 420 Sale. 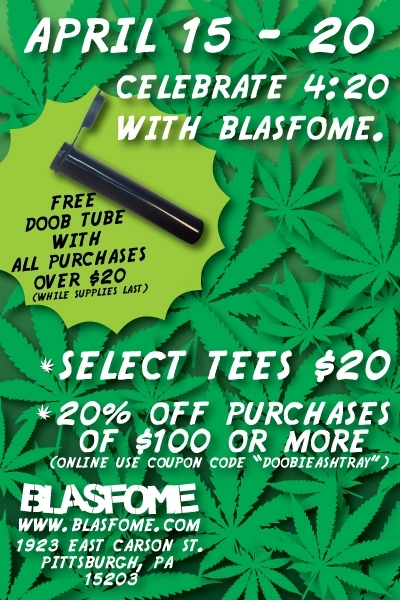 All purchases over $20 receive a free doob tube (while supplies last). Select tees are 20 bucks. Spend more then $100 and get 20% off (online use coupon code DOOBIEASHTRAY). Are you picking up the theme here? Dont forget to pickup this season Die-Cut stickers for your bike, car, or laptop!